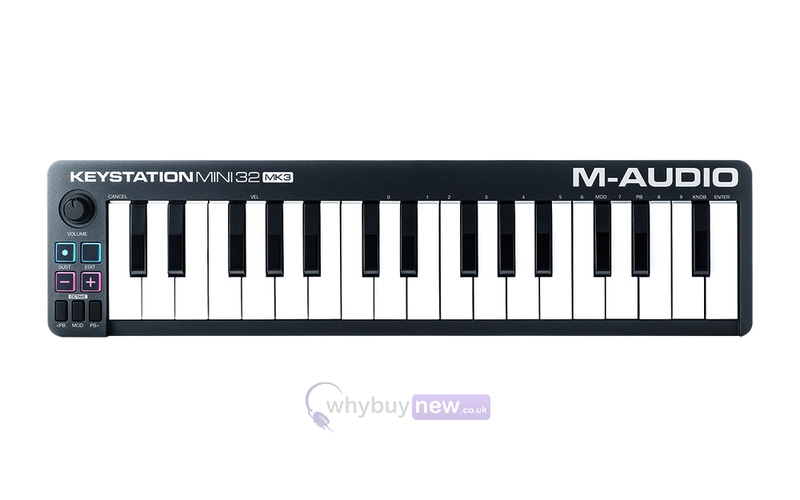 The M-Audio Keystation Mini 32 MK3 is a ultra compact and portable USB MIDI keyboard controller that is USB powered and a worthy successor of the much loved Keystation Mini 32 MK2. Just like its predecessor it comes with a fantastic software bundle, with the MK3 including Pro Tools First (M-Audio Edition) and AIR Music Tech Xpand!2. With these software kits you'll be making music in no time at all! Enter the world of unrestricted computer-based music creation and performance with the Keystation Mini 32 MK3 keyboard controller from M-Audio - successor to the iconic Keystation Mini 32 II. 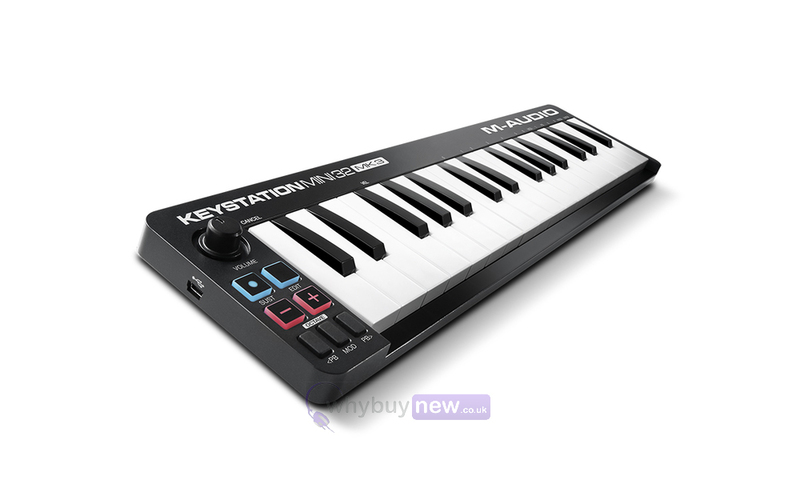 Whether youre a seasoned pro looking for just the right controller when youre on the go or youre looking to get started with the right mini USB MIDI controller, the Keystation Mini 32 MK3 is a simple, powerful MIDI controller designed for sequencing music and playing virtual instruments on your Mac or PC. Keystation Mini 32 MK3 features 32 natural feeling mini-size velocity-sensitive keys and comprehensive controls that expand the range of playable notes, expressive capabilities, and enhance your expressive possibilities. Pro Tools | First | M-Audio Edition isnt a stripped-down application. Its based on the same music creation and audio production tools that award-winning artists, musicians, producers, engineers, and mixers rely on every day. All built on the rock-solid, greatsounding Pro Tools audio engine. Over 70% of all commercial music is produced using Pro Tools. Pro Tools | First opens the door to a career in professional music production. Start learning the essential workflows required to succeed in the industry. Xpand!2 is a multitimbral workstation offering four active sound slots, or parts, per patch. Each part is provided with its own MIDI channel, Note Range (Zone), Mix, Arpeggiation, Modulation, and Effects settingsan excellent method for creating individual parts. Harnessing the four parts together to build one amazing Patch is where Xpand!2 reveals its true power. Using everything from wavetables and FM synthesis to sample playback, the expert sound design team at Air Music Tech has carefully created thousands of ready-to-play Xpand!2 patches. 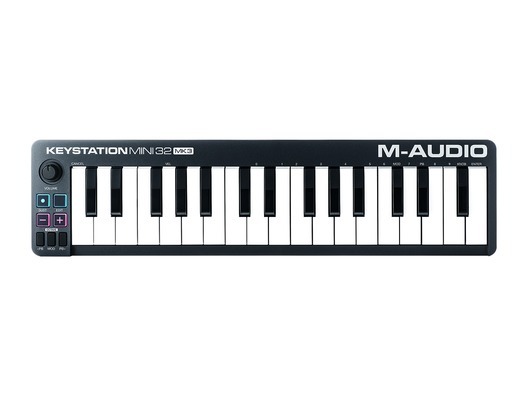 Here we have the M-Audio Keystation Mini 32 MK3 in brand new condition and in B-Stock. The B-Stock versions would have been on display at a training evening or trade exhibition only and will come boxed in excellent cosmetic condition with all accessories and a 1-year warranty. Dimensions (W x D x H): 418 x 105 x 20 mm / 16.46" x 4.13" x 0.78"